Even in the middle of the summer, I still find myself thinking about the upcoming school year and what I can do to make it even better than the last. 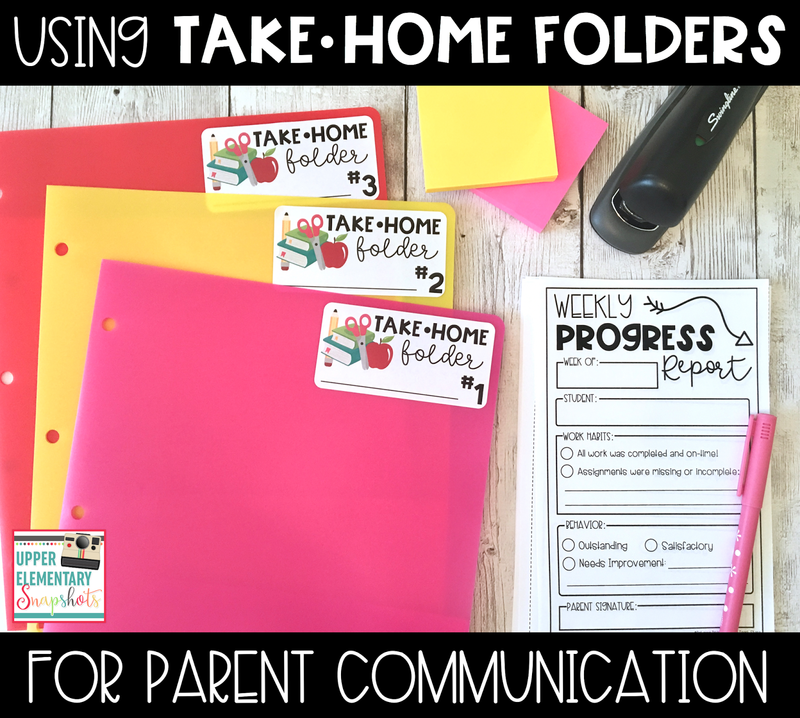 Today I thought I would share one of the routines that I use that keeps me in constant communication with my students' parents: Weekly Take-Home Folders!!! Take-Home Folders have been such a valuable tool for me ever since I started teaching. 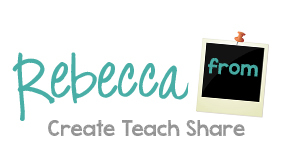 They serve as a way for me to communicate with my students' parents throughout the year. They allow me to share their children's work habits, behavior, and grades on a weekly basis, while also sharing important school and classroom information. I prep them every Friday, send them home every Monday, and ask for them to be returned before the end of the week, so they can go home all over again!! On the LEFT SIDE of the folder, I include graded tests, assignments, projects, etc. 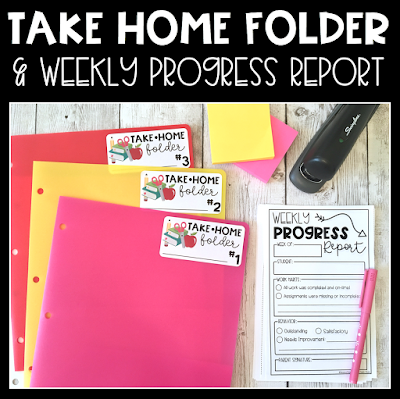 Attached to the top of these, I staple a Weekly Progress Report to share students' work habits and behavior. On this side, I also include any important papers that need to be filled out or signed (permission slips and such!). I ask parents to go over their children's scores and progress reports, and then sign the progress report to show that they have seen everything. This comes back to school in the folder. On the RIGHT SIDE of the folder, I include routine classwork and homework assignments and any school flyers that need to be sent home. Everything on the right side should be kept at home. People are often surprised that I put the time and effort into putting these folders together and sending them home each week. But for me, the benefits definitely outweigh the effort it takes to keep up this routine. First of all, parents always know how their children are performing. There are NO SURPRISES come parent conference time. Also, it gives parents a chance to have important conversations with their children about their work habits, behavior, and even about what they are learning in school. Lastly, it keeps me accountable for grading and reporting, and provides a record for me when I sit down to do report cards and conference with parents. 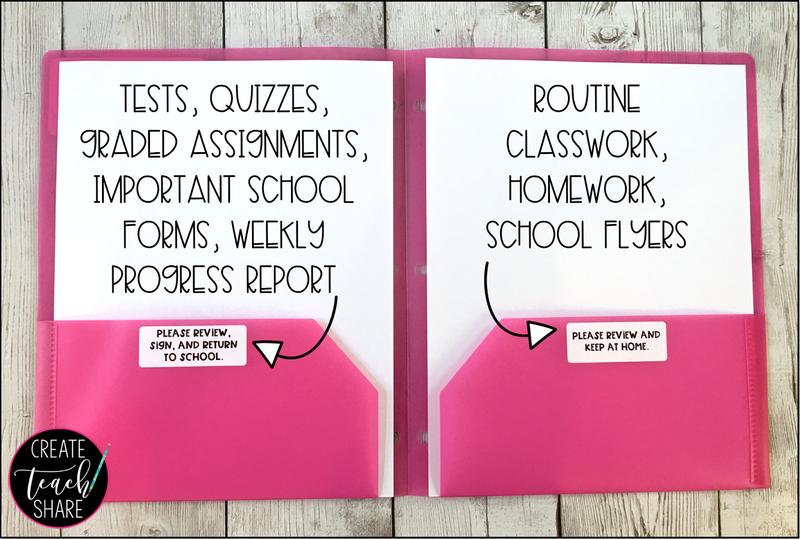 If you would like to download the labels that I use for my Take Home Folders, as well as a copy of my Weekly Progress Report for FREE, visit my teacher shop by clicking on the cover pic below!! This routine is a MUST for me each year! Paired with a weekly group e-mail, this is my main form of communication with parents, and it's been a HUGE success every year!! !